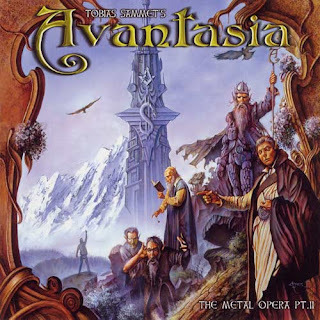 Avantasia (also known as “Tobias Sammet’s Avantasia”) is a power metal project created by Tobias Sammet, vocalist and frontman of the group Edguy. The project’s title is a portmanteau of the words “avalon” and “fantasia” (“fantasy”) and describes “a world beyond human imagination” (a quotation from the booklet). The project consists of a self-titled single, two full-length albums with the subtitle The Metal Opera, two EPs called Lost in Space, and second studio album The Scarecrow. Two new albums, The Wicked Symphony and Angel of Babylon are due to be released on April 3, 2010.